The withdrawal from Pleiku and Kontum begins, as thousands of civilians join the soldiers streaming down Route 7B toward the sea. In late January 1975, just two years after the cease-fire established by the Paris Peace Accords, the North Vietnamese launched Campaign 275. The objective of this campaign was to capture the city of Ban Me Thuot in the Central Highlands. The battle began on March 4 and the North Vietnamese quickly encircled the city with five main force divisions, cutting it off from outside support. The South Vietnamese 23rd Division, which had been sent to defend the city, was vastly outnumbered and quickly succumbed to the communists. As it became clear that the city—and probably the entire Darlac province—would fall to the communists, South Vietnamese President Nguyen Van Thieu decided to withdraw his forces in order to protect the more critical populous areas to the south. Accordingly, he ordered his forces in the Central Highlands to pull back from their positions. Abandoning Pleiku and Kontum, the South Vietnamese forces began to move toward the sea. By March 17, civilians and soldiers came under heavy communist attack; the withdrawal, scheduled to take three days, was still underway on April 1. Only 20,000 of 60,000 soldiers ever reached the coast; of 400,000 refugees, only 100,000 arrived. 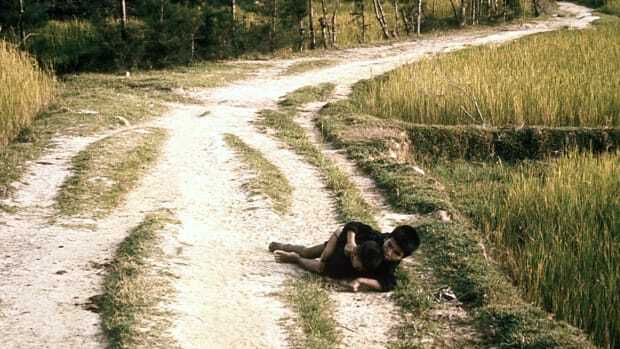 The survivors of what one South Vietnamese general described as the “greatest disaster in the history of the ARVN [Army of the Republic of Vietnam]” escaped down the coastal highway toward Saigon. The North Vietnamese overran the South Vietnamese forces in both the Central Highlands and further north at Quang Tri, Hue, and Da Nang. The South Vietnamese collapsed as a cogent fighting force and the North Vietnamese continued the attack all the way to Saigon. South Vietnam surrendered unconditionally to North Vietnam on April 30 and the war was over.